More than two centuries, not to mention two countries and two opposing sensibilities, separate the lifetimes of these giants in the history of art. Yet the fortuitous timing of these very different exhibitions has revealed some seemingly chance similarities between Leonardo da Vinci and Johannes Vermeer. The life of the struggling journeyman from Delft, dependent on his wealthy wife, father to 10 living children and famous only 200 years after his death, could not be more in contrast to the stellar career of the maverick, childless polymath loner from Tuscany, Leonardo da Vinci, whose patrons were dukes, popes and kings. But there are odd similarities. For complex reasons neither painter was prolific, each producing around 35 attributed paintings. 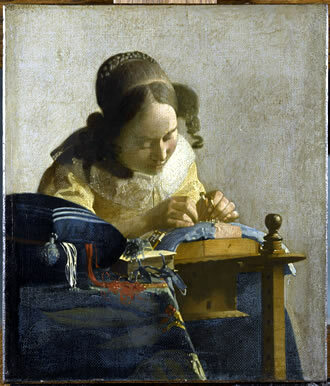 When not beset by domestic strife and financial woes, Vermeer worked very slowly, rigorously and expensively. When not studying hydrodynamics, anatomy or designing fortresses and flying machines Leonardo painted with supreme dedication, often experimentally. But there is much more than these bare facts that is striking. Each painter is deeply mysterious and remote, even secretive. Those beginnings of a smile in the Dutchman’s 1665 Girl with a Pearl Earring and the Italian’s Mona Lisa of 1502 (neither in these shows for obvious reasons) have something in common. But the many equally important and even greater portraits in both these shows sing out with a clarity and a sense of a self- contained inner life. Vermeer and Leonardo’s female sitters communicate to us across the centuries with consummate eloquence. Vermeer’s tiny but perfectly formed Lacemaker of 1670, here at the Fitzwilliam on a rare trip from the Louvre, focuses on her craft with deep concentration. 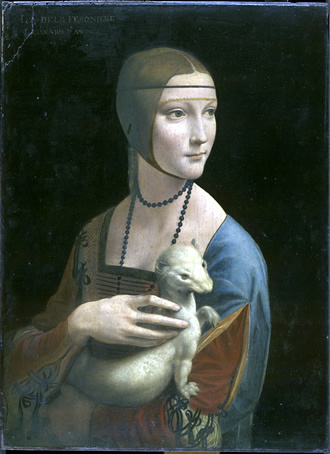 Leonardo’s portrait of his patron Ludovico Sforza’s teenage mistress Cecilia Gallerani, The Lady with an Ermine of 1489, on even rarer loan to London’s National Gallery from the National Museum at Cracow is a huge coup for the curators. It is the embodiment of what Julius Caesar called “ the unique exemplar of everything beautiful.” There is real, palpable intelligence in these portraits. There is thought. There is a captured sense of time itself. These are masterpieces. It is perhaps a misnomer to call the Fitzwilliam’s a Vermeer show. While there are four superb Vermeers (from Paris, two from London, and one from a private collection), the thesis explored is female domesticity in the work of the Dutch school of the day. The lives of servants, middle - class women, children and fine ladies in 17th century Holland in all its arcane subtleties were also depicted by Vermeer’s contemporaries among whom are the great Nicolas Maes, Pieter de Hooch , Gerard ter Borch and Jan Steen. There is an intimacy to this show that merits time and concentration. It is a triumph but it is a quiet triumph. It is like time-travelling into another world, where woman lived secret existences in which sewing and spinning, raising children and running households were the heartbeat of their hidden lives. Their gazes are averted and it is a hushed, private world we are allowed to trespass. In this crucial side of existence, Leonardo’s world is a million miles away from Vermeer and his contemporaries. There is nothing quiet about the show at the National, and we must thank our lucky stars for that. It is as ground-breaking and extraordinary as anything we shall see anywhere this century and is as good as it could be. Big words, but true. Not only does it boast a newly-attributed and thoroughly convincing autograph work, the newly-restored Christ as Salvator Mundi of 1499, the show is enriched by a rare generous loan, also from the Louvre. 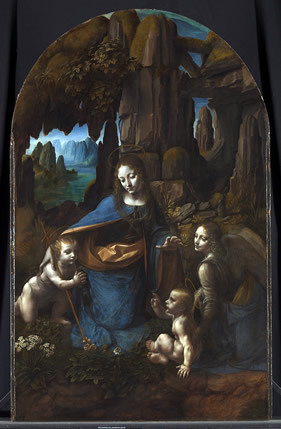 Leonardo’s iconic Virgin of the Rocks of 1483-5 has left its Parisian fastness for Trafalgar Square and looks all the better for it. The National is – rightly – making much of the juxtaposition of its own version of the painting, newly cleaned by Larry Keith, and looking spankingly other-worldly, shiny and silvery. 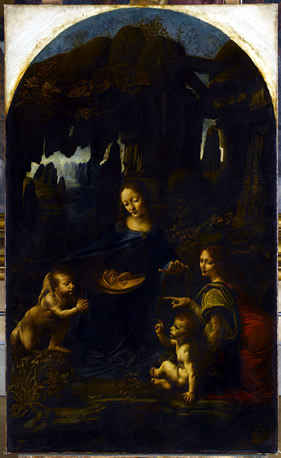 The London version of the Virgin of the Rocks, begun by Leonardo 10 years later than the Louvre version, is displayed in an elegant “face-off”, with the two paintings looking out at each other across the central gallery of the National, in a dim and hushed interrogation of each other. We are participating in a vision as unique and momentous as any in the history of art and one that was never afforded to the artist himself. This is a privilege not to be forgotten. Sell your car. Take out a mortgage. Quit your job. Buy your plane ticket, train ticket, or bus ticket. Get yourself to London and get in line. You will not regret it.